For the Mum who loves to read: Kindle Voyage by Amazon £169.99 – If your Mum loves to read then this is the ideal gift. It holds hundreds of books and makes reading on the go a lot easier. There are so many variations of the kindle now so check out which one would be best for your Momma. 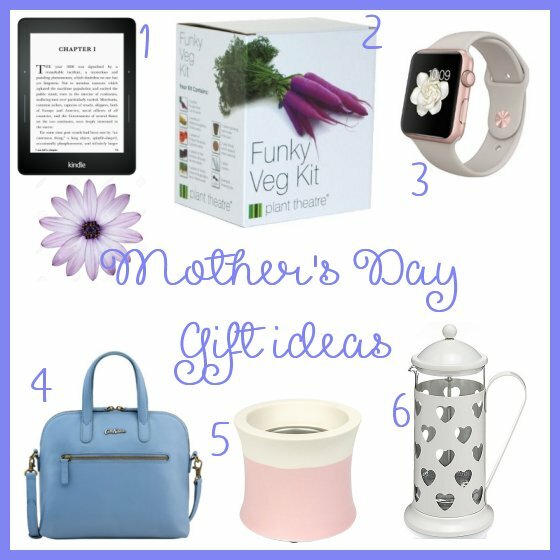 For the Mum who loves to be outdoors: Funky Veg Kit by Plant Theatre £11.99 – If your Mum enjoys pottering around in the garden/allotment then this gift could be a cool idea. It allows you to grow purple carrots, red brussels sprouts and stripy tomatoes plus two other seeds. For the Mum who loves technology: Rose Gold Apple Watch by Apple £300 – So this is a pricier gift but if your Mum loves technology and you can afford it, then why not treat her? There are so many apps available now for the Apple Watch and the feminine touch of Rose Gold makes this a great present for your Mum. For the Mum who loves to be glam: Mini Leather Handbag by Cath Kidston £85 – Sometimes the prints on Cath Kidston bags aren’t to everyones taste and so this plain leather bag is perfect for a classic look. For the Mum who loves to relax: Scenterpiece Melt Cup Warmer by Yankee Candle £27.99 – A new addition to Yankee Candles range. These Warmers are used with a small melt cup that sits inside it. They’re priced at £4.99 and come in a range of scents. For the Mum who loves coffee: Heart 8 Cup Cafetière by Marks & Spencers £19.50 – If your Momma loves a natter over a coffee then this would be a cute addition to her kitchen. I love the heart detailing. How will you be treating your Mum? Do you have a special day planned?